BELLIN - Carte Réduite De La Partie Septentrionale De L'' Isle De Terre Neuve..
BELLIN, J.N. - Carte Réduite De La Partie Septentrionale De L'' Isle De Terre Neuve..
Carte Réduite De La Partie Septentrionale De L'' Isle De Terre Neuve.. - BELLIN, J.N. Size : 23.6 x 31.0 inches. / 60.0 x 78.7 cm. Description :A well engraved and highly detailed chart, corrected to 1767. 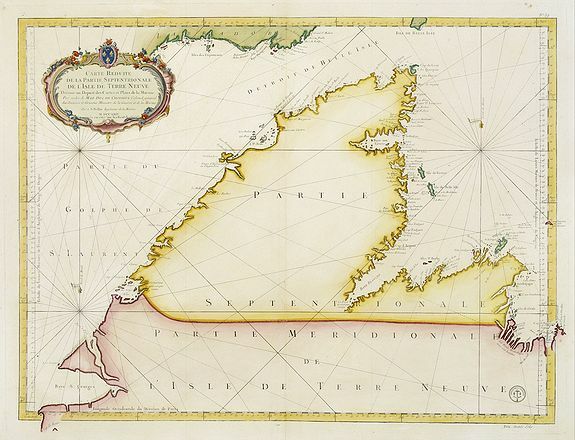 Elaborate hand-coloured cartouche, rhumb lines.Shows northern part of Newfoundland and southern coast of Labrador.